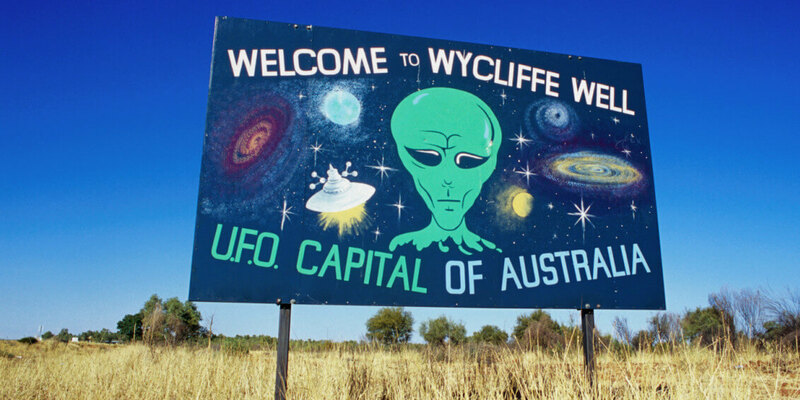 Home » Wycliffe Well Australia’s UFO Capital? Wycliffe Well Australia’s UFO Capital? Wycliffe Well is located on the Stuart Highway 130 kilometres south of Tennant Creek and 380 kilometres north of Alice Springs in the Northern Territory Australia. It is known as Australia’s UFO capital due to the hundreds of UFO sightings that have occurred there since WWII. Wycliffe Well began as a watering point along the stock route for the Overland Telegraph Line in the 1860s. During World War II the Well became a market garden centre to service troops, and at the end of the war, two soldiers stayed on to continue selling vegetables and garden products to Alice Springs. In 1960 a petrol pump was installed to supply fuel to travelers. Since then Wycliffe Well has become a tourist stop over point. The town today essentially consists of the Wycliffe Well tourist park which covers 60 acres of land and includes a recreational lake for fishing and boating, a Bar that has the largest range of beer available in Australia plus three life-size Alien figures and a large model UFO! According to the tourist parks brochure, “UFO sightings are so common, that if you stayed up all night looking, you would be considered unlucky not to see anything, rather than lucky to see something”. According to local Folklore UFO sightings have occurred in the Well since WWII. Even a binder book containing records of UFO sightings from this era was kept until it was stolen from the tourist parks front counter some years ago. Sightings from the 90’s have since been kept by the tourist park staff. The local restaurant‘s walls are covered with newspaper clippings written by UFO skeptics and believers alike. Wycliffe Well is one of the top 5 UFO hotspots in the world that can guarantee a sighting every couple of days. Lou claims that because Wycliffe Well is one of the flattest places in the region it allows a 360 degree view of the night skies. This allows a great vantage point to see unidentified objects in the sky. Lou has operated the Wycliffe Well Roadhouse for over 20 years and originally had no interest in UFOs until he moved there. He claims that he has seen so many no longer bothers looking for them and waits for visitors to report them. He also claims that he has nothing to prove to skeptics and suggests they come and take a look for themselves to make up their own minds. Lou has also heard many bizarre theories over the years of what the UFO’s may be? One in particular is the theory is that the lights in the sky are Fluorescent birds! “Can you imagine the size of one of those birds?” He laughs. He also claims there have been many visitors from the UK and Japan who bring with them sophisticated equipment. Only after a few days of taking readings they leave. UFO descriptions from Wycliffe Well include; Cigar, Square and Rectangular shape. Square shapes morphing into circular. Pulsating and flashing lights. Orange, Green and Red spinning lights. Others that shoot out beams of different colours. UFOs have also been witnessed hovering above the ground. One case in particular where a “huge’ craft was seen hovering 100m above the parks toilet block that took off at an astonishing speed. Daytime sightings have occurred, sometimes UFO’s have known to follow cars but seem to generally uninterested in people with claims of abductions being very rare. It could be speculated that some UFO sightings in Wycliffe Well are attributed to vehicles being tested at the Woomera Prohibited Area which also is located on the Stuart Highway. The WPA is sometimes referred to as Area 52 or Australia’s Area 51.